Joining the ranks of the ever popular Tonka Town toys comes the incredible Tonka Town Air Rescue Set. Perfect for preschool children aged 3-5, they can recreate all the excitement of an important emergency rescue situation. They may be helping injured passengers from a crash, or using the toy helicopter to winch people to safety from the sea. An emergency casualty stretcher is included in the set together with a specialist work station. Kids can use their existing Tonka vehicles to help with the emergency or scramble the chopper from its roof mounted base that’s even fitted with realistic ‘take off ‘ sounds. You can also listen to the walkie talkie messages for landing and recovery. 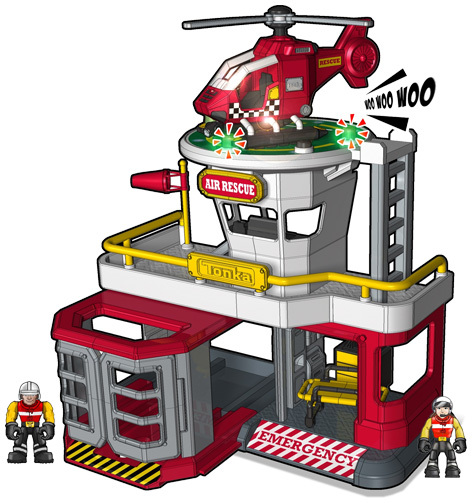 Packed full of accessories and including Lucy and Jack two of the Tonka emergency workers, the Air Rescue Set complements the Town Fire Station playset and spectacular Fire Engine. Please tell us what you think of the Tonka Town Air Rescue Set by Tonka.